Hi friends! 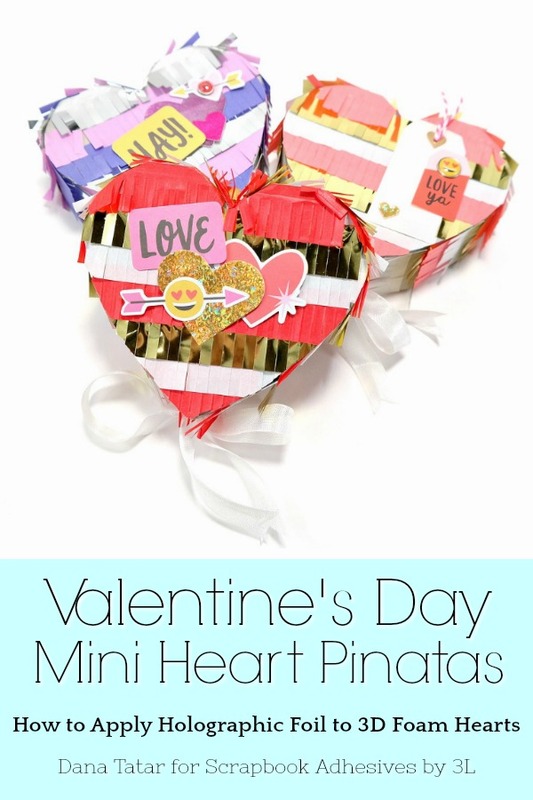 Dana Tatar here today sharing a trio of heart piñatas that I assembled for my sweethearts for the upcoming Valentine’s Day holiday. I applied the NEW Metallic Transfer Foil Sheets Holographic to 3D Foam Hearts for extra sparkle and shine. To begin, fill a heart piñata with candy. Next, secure a length of ribbon, that will help break open the box, to the bottom. 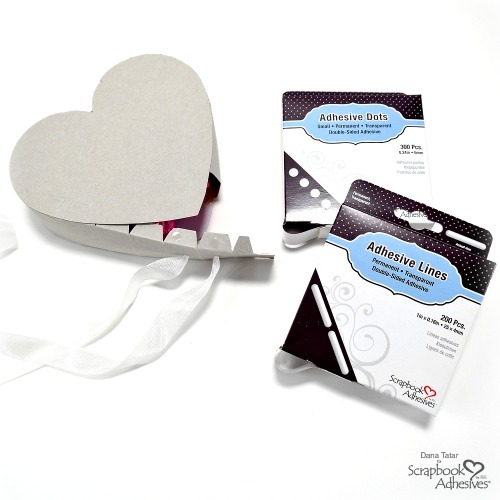 Then, apply Adhesive Dots and Adhesive Lines to the box flaps and tabs and press to seal. 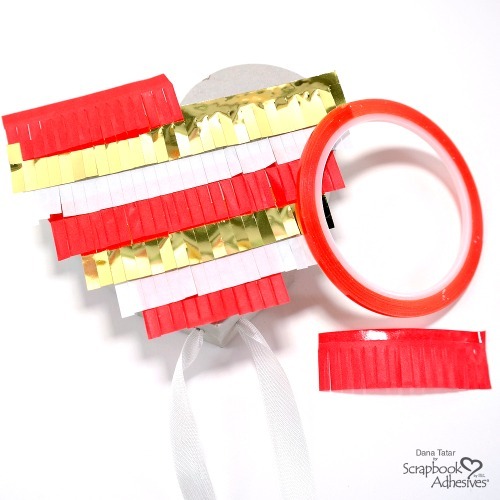 Decorate the outside of the piñatas with fringed paper in a variety of festive colors. Use Extreme Double-Sided Tape to firmly hold the paper to the box. Finally, apply Metallic Transfer Foil Sheets to 3D Foam Hearts. To gild, touch the underside of the foil sheet to an adhesive surface and gently rub. Then, carefully peel away the sheet to reveal the foiled element. 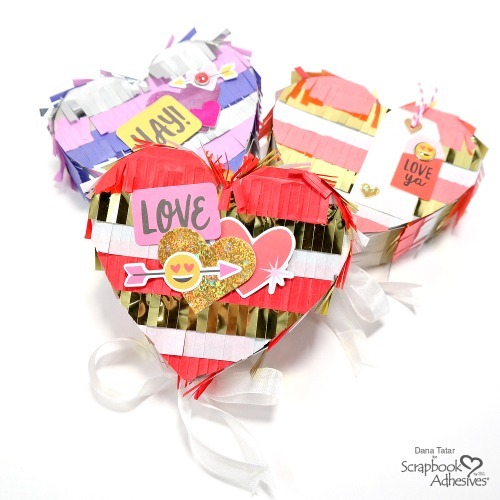 Add the foiled hearts to embellished die-cuts and tags and secure them to the front of the heart piñatas. Designer Note: I used the Gold Holographic Foil from the Metallic Transfer Foil Sheets Holographic on the red and pink piñatas. I used Magenta and Purple Metallic Foil from the Metallic Transfer Foil Sheets Variety on the purple piñata. The jewel tones in this package are gorgeous! These new foil transfer sheets measure 6×12 inches. Thanks so much for stopping by today! Stop by my blog for the full tutorial. This entry was posted in 3D Foam Shapes, 3D Projects, Adhesive Dots & Lines, Adhesives, Altered Art, Beginner, Crafts & Tutorials, Embellishments, Extreme Double-Sided Tapes, Gifts, HomeHobby by 3L, Party Favors, Permanent Adhesive, Seasonal Craft Ideas, Skill Level, Tutorial, Wear your Adhesive on the Outside, Winter and tagged 3D Foam Hearts, Adhesive Dots Small, Adhesive Lines, Dana Tatar, Extreme Double-Sided Tape 1/8", Metallic Transfer Foil Holographic, Metallic Transfer Foil Variety, Party Favors, Pinatas, Simple Stories, Tutorial, Valentine's Day, WRMK. Bookmark the permalink.